I was looking for this 2014 model in Jade color everywhere but it was discontinued. 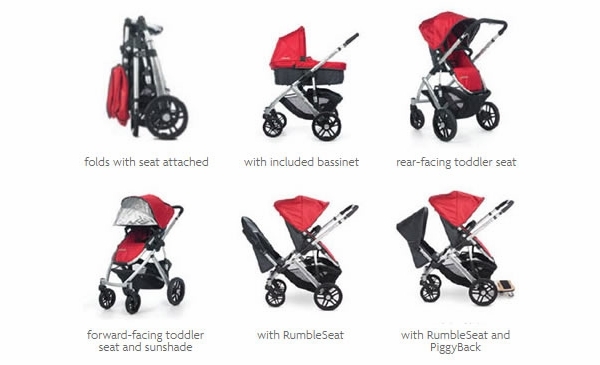 When I saw it in stock on Albee, I thought the site is not updated =)) When the order went through, I started waiting for an apologetic email saying that the item is not available, but instead, I received my stroller -- next day, in fact!!! The service and shipment was amazing. 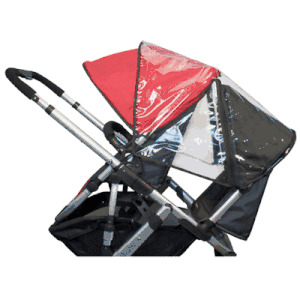 The item itself is one of the best stroller out there -- I had a 2010 model before this one. The ride is smooth, the versatility is superb, it performs reasonably well off-road on loans and gravel. The basket is so spacious that I go grocery shopping with it! And the color -- oh my God! It is sooo much better than the blacks, navy blues and charcoal greys they offer now. I LOVE MY STROLLER. Thanks Albee! This is the second Uppa Baby Stroller we have. We are loving it.Great for tall people, very sturdy, great for the bumy road. Love the huge basket. Best Stroller I have owned!! I love it and so far I would say its worth every penny! I love how easy it is to pop the car seat into the stroller (the car seat comes with adapters which asre super easy to pop in), the bassinet is awesome and my baby loves sleeping in it. Awesome Purchase!!! I'm in love with this stroller! I looked into several before finding the Uppababy Vista and none convince me until I decided to spend a little more, it was all that i was looking for! Albee Baby was a life saver for us. We were looking for Drew Color 2014 Uppababy Vista stroller and i researched many websites, until i saw one available at Albee Baby. First i thought that like all other websites, Albee Baby will take me to the product page and say this is not available and that I should buy the 2015 model. But to my surprise they had one available as they mentioned on the front page. I was so delighted. I ordered one and they gave me a date of delivery. They delivered a day before.. superb customer service. The package arrived in excellent shape. the product is great to use. And above all Albee Baby gave me reward to buy another product which I am ready to buy now. Thanks Albee Baby so much !!!! Great colour, and relatively big size. Solid built, come with all accessories like rain cover, nets etc. We love this stroller so much. The big basket underneath holds entire food shopping trips, and the wheels are big enough to get through slush puddles with ease. It folds down much more easily than I had anticipated, and the graphite frame is just SO cool. you wouldn't believe it, i bought this stroller cause its a uppababy and i like to be fashion also the secure for my baby and stuff i read on the internet, but the best part was.... ALBEEBABY GAVE ME $100 EXTRAS AS A REWARD!!!!!!!!!!!!!!!!!!! SO I PURCHASE ANOTHER STUFF!!! SO FREAKING HAPPY WITH ALBEEBABY!!! My husband and I finally gave in and bought the UppaBaby Vista stroller as we are expecting baby #2 and knew we would be needing a stroller that can convert to a double stroller (we have the toddler extension called the rumble seat and will use it once baby arrives). Baby isn't due till August but we thought we would get it early so our 1.5 yr old can enjoy it now, and boy are we glad we did! The stroller is SO easy to maneuver with one hand and it's the smoothest ride for our boy. We also live in the city so we do a lot of local grocery shopping while out on walks so the extra roomy basket at the bottom is perfect to store all the many groceries (or park toys! ).We originally didn't buy this stroller for our first child as we thought it was too expensive, but for the gentle ride for our little one and the great durability, it is worth every penny!!! It's a very well made stroller - you won't be disappointed. This stroller is very sturdy and easy to push. We didn't use the bassinet for too long, but the seat has been well used through 2 kids and still in good condition. I could not be happier with my purchase. 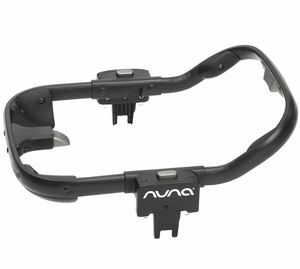 It is light weight, super easy to fold and very nice to travel with. We have purchased this in anticipation of our little one's arrival in October. I put it together yesterday, and it was simple to do, easy to maneuver and turn. Storage area seems very large. We bought this stroller (older version) because of many advantages that other strollers don't have. 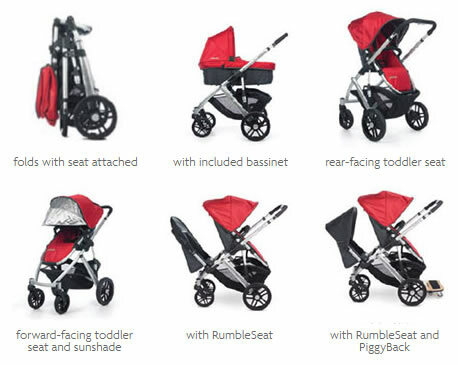 Here are some of them:- This stroller has the biggest compartment, which is very important because you need it to store many of your baby/ kid stuff. 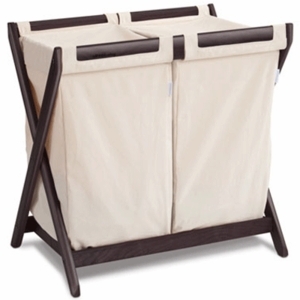 - We used the basinet a lot at home when our baby was still a newborn up until 4 months. It's pretty handy to have it in our living room. - The seat can be rotate facing forward or back. Very nice feature.- This stroller can be expand for another child (rumble seat and piggy back). We purchase a rumble seat when our 2nd son was born. And because of the generous compartment, our oldest son's feet are not cramp in it. - It is very easy to maneuver, to fold and unfold, and big canopy with extra sun protection cover. I love this stroller. I love that it sits up high, the color, that it is machine washable, has an adjustable footrest, and can be forward facing or facing the parent. It is heavy, but I love all the features so it makes it worth it for me. It sits high up so my daughter can see well and I don't have to bend over really far to get her in and out. I feel like for the money it should have came with the snack tray. I also wish that there was an option to get it without the bassinet because I got this stroller when my daughter was 15 months and I didn't need it. I wish the company was a bit more clear and honest about what chemicals and things they use in their products. I received different answers on different phone calls and with different emails. I was told it was free of flame retardants and that it wasn't. So I don't know. I DO know that as of 2014 strollers are not required to have flame retardants. I also wish these products were made in Canada, the UK or USA- not China. 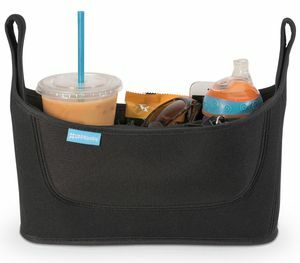 I also wish there was not a big bar going through the stroller basket because my diaper bag gets stuck under it. But, I looked at every stroller in a few different stores before deciding and overall this had the most features that I wanted in a stoller. I like the shoe friendly brake. I have to say I love this stroller! All my friends told me to buy the city select, but I went against their recommendations and bought the Uppa Baby. I think for the price you get way more than with other strollers. The bassinet is great, my daughter slept in it for the first 4 months until she grew out of it. We could take it anywhere and she was able to sleep on the go. The basket underneath is huge and holds a ton, great for shopping. My husband loves the fact that the handle bars extend for him. We went the wheat color and surprisingly it is easy to clean and hides dirt well. 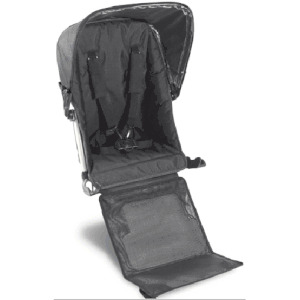 This stroller is super easy to put together with either the seat or bassinet attached. It's lighter-weight than several travel system strollers, even though it isn't small. It pushes and turns so smooth and easy and is the best looking stroller around. 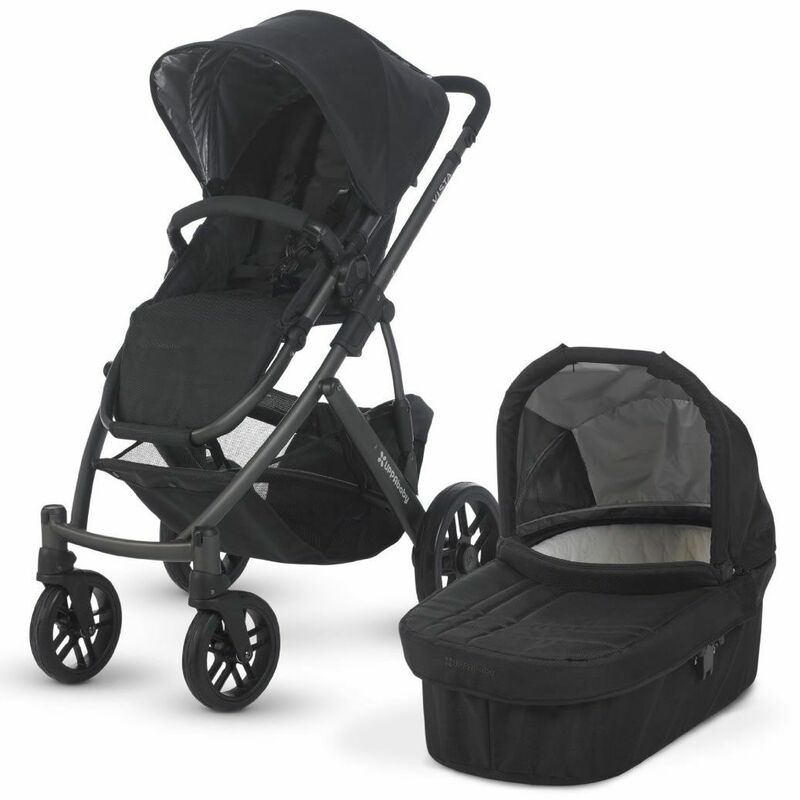 I love the sleek, all black look and am super happy with our investment in this stroller. It's for our second child and is the only stroller we plan on purchasing and will be using for 4-5 years. I decided to make one fairly large investment in a nice stroller I really want vs go through 2-3 less expensive strollers over the course of the years like I did with my first child and end up spending about the same amount all together. 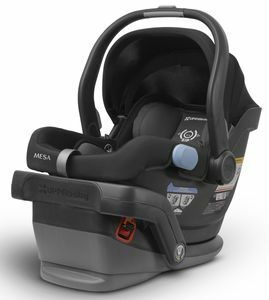 We have the Cybex Aton car seat and will possibly buy the Maxi Cosi adapters to use as well. This is a great stroller. I love that everything is so easy. I only used the bassinet a couple times while walking around the neighborhood or also at a picnic so the baby could sleep. 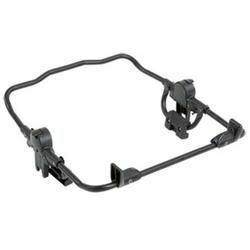 I use this mostly with the Chico adaptor but also have the extra rumble seat for my daughter. I love that the seat that comes with this can be reversed so the child can either face you or look out. Highly recommend. I don't have much to say, exactly as I expected, love the adjustable handle as both my wife and I are 6'1". 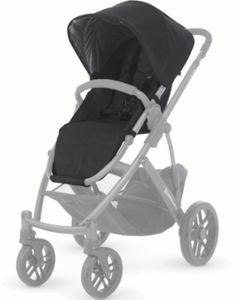 I received this stroller within two days of placing my order, with free shipping! My sister and fiance easily put the stroller together. The attachments are easy to understand and connect. Still can't believe I got it for $200 cheaper than anywhere else! Can't wait to put it to use. Having 360' rotating and big wheels this stroller is bery easy to go with! Light weight and bright colour are enjoyable! Best prices, all on time. Expensive but well worth it! Love it! The only thing I don't like is the bassinet is so light sometimes the front two wheels shake like a cart at the grocery store that has wheels that are messed up! Not all the time so it is not terrible but is frustrating at times... but very satisfied overall! We love the Uppababy Vista. We've had trouble getting our newborn to sleep in the bassinet, but that doesn't diminish our appreciation for both of them. We took the stroller out for the first time this week and had a great neighborhood walk. This is my second time purchasing this stroller. I purchased the first one two years ago but the stroller was stolen from us. I couldn't live without one so i had to purchase another one. i love this stroller so much . 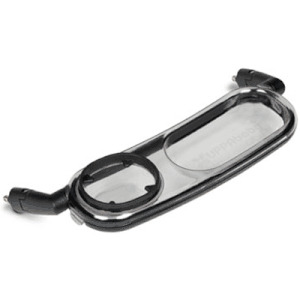 its very easy to use and very reliable. The best company to deal with got it a great deal on the stroller. Would highly recommend this company and this stroller. The basket is huge!!!!!!!!!! ProsThe best company to deal with got it a great deal on the stroller. Would highly recommend this company and this stroller. The basket is huge!!!!!!!!!! I've only used this stroller with the bassinet attachment but i love it. The bug net is genius!The tires are big enough to take it off-road. What a wonderful item! I was talked into this by a friend who wished she had bought this from the beginning. She went through several strollers until she came across this one and regrets ever wasting money or time on all the others. 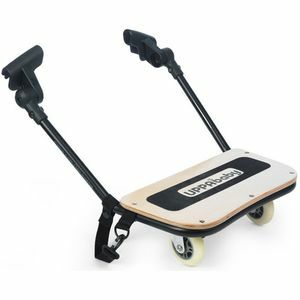 It has a great turning radius, a smooth ride, everything snaps on and off so easily, and its light weight. Best baby item I have! From busy city streets to winding country roads; from an afternoon feeding the ducks in the park to retail therapy - the VISTA takes your child on the road in style. Designed to grow with your child, the VISTA is the ideal strolling solution from birth through the toddler years. It adapts easily to your growing family with solutions for a big brother or sister. There?s a lot for your little one to see ? get out there and get strolling! Toddler Seat: Suitable from 3 months to 50 lbs.